BabelBark connects pet parents, pet retailers, service providers and veterinarians to improve the management of pets lives and increase marketing and sales opportunities for pet providers. BabelBark, a pet related software developer located in Newton, Massachusetts, will unveil the first fully functional and live mobile application and software platform at SuperZoo. Now out of beta, the free app and portal connects pet parents, pet retailers, service providers and veterinarians to improve the management of pets lives and provide tracking, marketing and sales opportunities for pet providers to increase revenue. Connecting with customers and allowing them to share their brand preference and detailed pet profiles. Creating targeted promotions for upselling products and services for increased revenue. Enabling customers to easily schedule and pay for services online. Providing the ability to send reminders for annual visits, vaccinations and appointments. Allowing clients to access and share medical records, saving valuable time for practitioners. Providing detailed information about patient food brands, dosage history and activity between visits. Creating upsell opportunities for increased revenue. Connecting them with their favorite pet businesses and veterinarian to make scheduling and payments a breeze. Tracking detailed activity through an optional pet fitness monitor. Storing and securely sharing medical records, brand preferences, and care information. Receiving alerts for appointment reminders, coupons, discounts and more. “For the past several months while in beta, BabelBark has shown to be very effective in helping pet parents manage and keep track of their dog’s health and activity, while helping them stay in closer contact with all the service and product providers they utilize to more effectively manage their dog’s life,” says Roy Stein, founder and CEO of BabelBark. 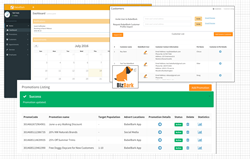 “Also just out of beta, BizBark, the online portal for pet retailers, service providers and veterinarians has shown to be a very effective, popular and inexpensive way for those who serve the pet industry to communicate more effectively with their customers and clients, and at the same time provide them with amazing customer management and marketing tools to keep their businesses running more smoothly and effectively, while increasing sales and revenue,” added Stein. BabelBark will unveil their new live (out of beta) platform and app at SuperZoo, August 2-4, 2016, Mandalay Bay, Las Vegas. The mobile app (for pet parents) is now available for iOS via the App Store; and pet businesses can sign up for BizBark online at http://www.BizBark.com. Visit BabelBark at booth #2153 at SuperZoo for more information and to see the app and online portal live, or visit babelbark.com for more information. BabelBark is dedicated to bringing families an easy way to connect the many facets of their dog’s life through a mobile app that tracks activity and connects with their favorite veterinarian, pet store, groomer, dog walker, pet sitter, groomer and more…all to help pet parents understand their dog and provide them the happiest and healthiest life possible, while helping pet businesses and veterinarians maintain a closer relationship with their customers and clients. For more information, visit babelbark.com or email at info(at)babelbark(dot)com.